Fresh air, the rolling sea to lull you to sleep at night and the gorgeous smell of frying bacon and eggs in the morning (if you’re not the muesli type) – it’s easy to see why most Australians these days opt for a wholesome outdoor Byron Bay camping adventure. And who can blame them? Especially when we’re guaranteed wonderful weather most of the year round. Another appeal of Byron Bay camping is the fact that we’re a very laid-back race (yes well, most of us are), even the city slickers amongst us love to pull on shorts and a vest and head to the hills so we can appreciate the earth, sea and sky for all its vastness and natural beauty (something we just don’t get a chance to do locked in our glass offices and concrete homes for so much of the year round). Check out these Byron Bay camping tips for more comfortable camping advice. 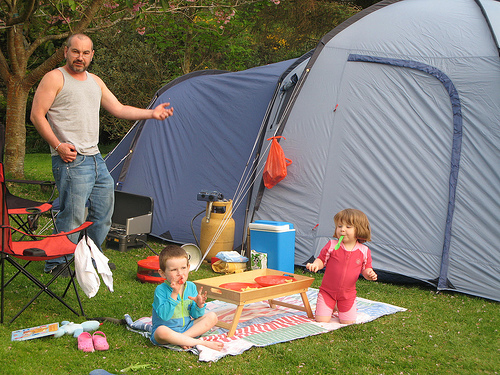 Holidaying in a beachside cabin or caravan in one of our powered camping sites is another option. Here at Broken Head Holiday Park we’re big fans of comfortable accommodation. And we’re not the only ones; such is the popularity of our sites. Provided you book in advance however, there’s no problem – and no disappointments (and little one’s tears) to be endured come holiday time. One of the reasons Australians love hitting the outback and wilder terrain (or at least getting out of the city) is to feel themselves embracing nature in all its colourful splendour. And by default that means leaving the technology at home (yes, it is possible). Sure, take along a Smartphone to keep in touch with family and friends back home but leave the computer in the desk drawer and try to keep the kids’ gadgets to a minimum – otherwise you might as well be back home surrounded by the same four walls you’re enclosed in the rest of the year round. We’re fortunate not only to offer a cheap holiday camping site in Byron Bay, but to have some of the most spectacular scenery in the whole of Australia. Not only are the beaches blessed with beautiful white sands and coves but many of the more out of the way little coves remain unpopulated most of the year round. Then there is the abundance of nearby nature parks with colourful and abundant flora and fauna, not to mention impressive waterfalls and great rocks for scrambling. Yes, on the subject of scrambling and rock climbing, there are so many opportunities for exercise when camping in a beach resort and nature park environment. Many of these are contrived – such as water parks and abseiling adventures – but at Byron Bay trekking, swimming and fishing are some of the natural sports and activities enjoyed by our guests. Activities such as surfing and mountain biking are no longer just the preserve of the young – you’ll find grandpa just as willing to hop onto a board as his offspring’s offspring. Camping in a tent there’s a chance that the nice guy and his family located just five feet away from your own may actually become a bitter enemy rather than a mate. That’s because his fog-horn snoring is louder than a thunder storm. Pack him into a campervan though and you’ll be in blissful ignorance for the duration of your holiday. Just don’t agree for the two families to share a beach side chalet next year! Seriously though, being on holiday when everyone’s relaxed and laid back in the extreme is a great way to meet up with new folk. And, for that matter, for healing rifts within your family. After all, with such busy stressful lives these days, we don’t always get the time with our kids and other half that we need. So have we persuaded you yet? If so, check out our Byron Bay camping accommodation, we promise you won’t be disappointed. And you just may return the following year too.